In Patch 9.5, Riot threw Vi players a "bone" in the form of a Passive buff, a Q "nerf" that ends up really being a buff, a W buff, an E buff, and of course, an R "nerf" that really just again becomes another buff. In the end, this ended up pumping up her win rate and of course, skyrocketing her playrate. Overall, this looks like a flat nerf to her passive. However, she received some synergy on her Denting Blows [W] that reduces her cooldown by three seconds every time she uses it. Essentially, she ends up with more shield faster once she picks up her Trinity Force (AKA some attack speed). This is a slight nerf to her damage on champions, but really ends up being a buff to her jungle clear speed. This double buff provides her increased attack speed and of course the passive we talked about earlier. Overall, it ends up being a fake nerf to her Blast Shield and an overall buff. This one is particularly interesting due to the possibilities it opens up. Vi doesn't normally build crit and most players haven't tried crit Vi yet, but this does give Vi the potential to do significantly more burst damage...in an AOE. This again looks like a slight nerf, but what it really does is it gives Vi a TON more AOE damage, especially if enemy tanks and supports are covering their marksman appropriately. The cooldown doesn't hurt much since it's plenty of time to come back up for every team fight. These changes to Vi included some fake nerfs that really end up being overall buffs. As a result, Vi's skyrocketed to become one of the best junglers on the Rift in her current state. 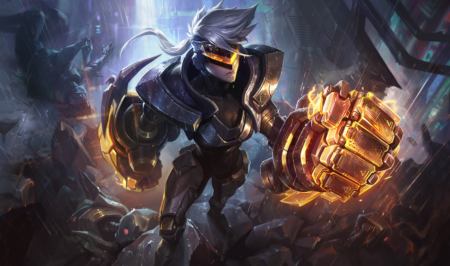 What do you think about Vi in Patch 9.5? Comment below!